“…This is not going away.” Larry Kudlow, Chief National Economic Advisor said on Sept 6 2018 in an interview with CNBC discussing the surprisingly stronger than expected recent economic data. While we generally agree with Kudlow on most points, we disagree here. It will go away at some point but the question is, when? Add all that together and what do you get? Economic growth conditions that are hard to argue with. But here’s the thing to remember – nothing lasts forever and eventually this robust rally will begin to fade. No one can predict when the fade will happen, but eventually it will, and therefore it’s prudent to make sure long-term preparations are in place for when it does. We still maintain our previous consensus that the economic expansion we are currently experiencing is going to keep going until 2020 but now we are considering the scenario past that date. On the flip side of that positive coin is the risk of inflation, the primary threat to our current domestic economic situation. If inflation increases too fast, it has the power to bring the entire economic expansion to a screeching halt. In determining what events can lead to excessive inflation we just need look at the flip side. Higher wages lead to higher spending and saving, both of which can lead to higher inflation. Who would have thought that rising wages could cause an economic downturn? But it can happen if the Fed doesn’t manage the situation properly. Especially when it comes to unwinding the massive financial stimulus programs implemented during the Obama administration. The Federal Reserve will need to thread the needle so to speak, in order to keep inflation under control and if we do see an unexpected downturn in economic activity they do not have many options given interest rates are so low. Another unique issue we are facing is that there aren’t enough jobs out there. In June we had 6.7 million job openings and just 6.6 million Americans classified as unemployed.4 Unprecedented imbalance could cause production to stall if not enough skilled labor was available to produce the goods and services needed. • The S&P/Case-Shiller Index reports that national home prices have steadily increased since 2012 with the index sitting at 211.48 in June. 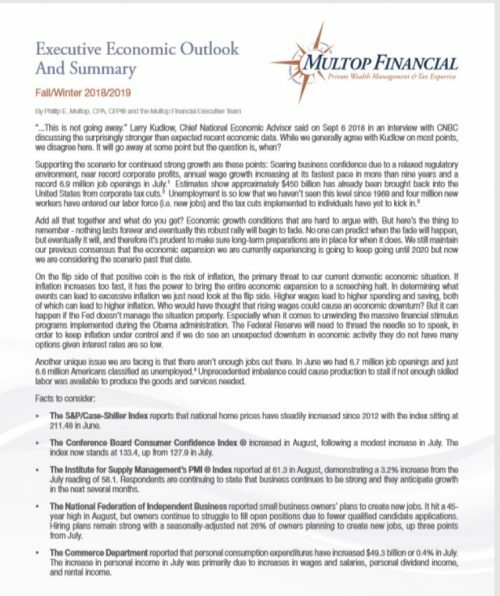 • The Conference Board Consumer Confidence Index ® increased in August, following a modest increase in July. The index now stands at 133.4, up from 127.9 in July. • The Institute for Supply Management’s PMI ® Index reported at 61.3 in August, demonstrating a 3.2% increase from the July reading of 58.1. Respondents are continuing to state that business continues to be strong and they anticipate growth in the next several months. • The National Federation of Independent Business reported small business owners’ plans to create new jobs. It hit a 45year high in August, but owners continue to struggle to fill open positions due to fewer qualified candidate applications. Hiring plans remain strong with a seasonally-adjusted net 26% of owners planning to create new jobs, up three points from July. • The Commerce Department reported that personal consumption expenditures have increased $49.3 billion or 0.4% in July. The increase in personal income in July was primarily due to increases in wages and salaries, personal dividend income, and rental income. • The Bureau of Labor Statistics reports that the official unemployment rate (U-3) seasonally adjusted in August was 3.9% which is the lowest level since 1969. The U-6 unemployment rate, a more comprehensive measure of unemployment, was 7.4% which is down 1.2% from August 2017, a year prior. • U.S. Real Gross Domestic Product increased at an annual rate of 4.2% in the second quarter of 2018, according to the “second” estimate released by the Bureau of Economic Analysis. In the first quarter, real GDP increased 2.2%. https://www.bea.gov/data/gdp/gross-domestic-product. • CBOE Volatility Index (VIX) has experienced quite a bit of volatility in 2018 with a significant spike in early February, closing at its 52-week high at 37.32. In recent news, the index sits at 13.68 in September. Trade war issues and the potential of a rising US Dollar give cause to be cautious about engaging in Emerging Markets and International stocks. A significant level of resistance has become apparent after tariffs have been imposed mostly on Chinese and European countries. Other conditions remain positive in these areas, until the full impact of these tariffs is fully digested by the markets. It appears this component of the global economy is uncertain and should be approached as such when considering allocating portions of an investment portfolio. Both International and Emerging Markets carry far more complexity than US markets – the biggest risk in this area being the effects of the US Dollar gaining strength globally as economic strength would increase demand for US Dollars. What does all this mean to your investment portfolio? 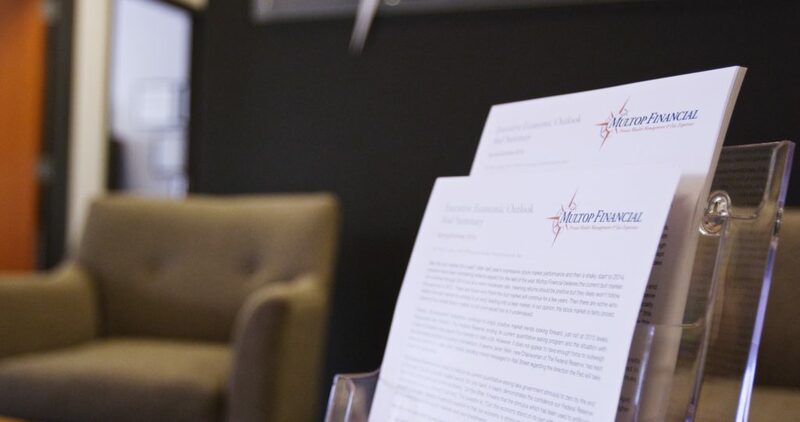 We currently recommend investors maintain a portfolio which is fully invested and has a specific focus on US equities with an emphasis toward growth stocks. Differentiating allocations between large-cap, mid-cap and small-cap stocks would depend on an individual’s overall risk tolerance, time horizon, goals etc. Bonds, as they have for some time, remain unattractive and pose a real risk to the downside while we remain in this rising interest rate environment. Concerns about the effects of a rising US Dollar give reason to be less optimistic towards International and Emerging Markets investments in the short-term as well. Overall, the clear story supports investments in United States equity markets. In 2019 there may be a shift from Growth to Value stocks as Large cap value stocks become more of a bargain. If you are currently one of our valued clients your portfolio already reflects this philosophy. With regards to “risk tolerance” we will be reviewing each client’s level during our annual review appointments coming up over the summer months, and we advise investors in general to update your goals, tolerance, and overall plans at least annually to be confident about your positions in the market. If you are not yet a client and would like to get access to these strategies, please contact our team for a complimentary consultation and review of how we may be of service. The summarizations and outlooks presented here are to be used for overview purposes only and are prepared according to the opinions of Phillip Multop and Multop Financial. Specific portfolio recommendations should be made after careful advisement and advice with your personal financial advisor. Past performance is not a guarantee of future results. Investors cannot invest directly in indexes. The performance of any index is not indicative of the performance of any investment and does not take into account the effects of inflation and the fees and expenses associated with investing. Phillip Multop is a Certified Financial Planner with a Master’s Degree in Taxation. Please browse our website to learn about our recent awards and recognitions as well as the firm’s client objectives and investment philosophies. The economic forecasts set forth in this material may not develop as predicted and there can be no guarantee that strategies promoted will be successful. The MSCIEM (Emerging Markets) Index is a free float-adjusted market capitalization weighted index that is designed to measure the equity market performance of the emerging market countries of the Americas, Europe, the Middle East, Africa and Asia. Securities and advisory services offered through LPL Financial, Member FINRA/SIPC, a SEC registered investment advisor. Multop Financial is not an affiliate of LPL Financial, and offers tax and accounting services separate and apart from LPL Financial.